Ok so here’s the story: I made Pierre Hermé’s Tarte Tropézienne today, which calls for brioche. The problem is the brioche recipe produces enough for two cakes, but the brioche will not be successful if you make a smaller amount. So Pierre gives a few options what you can do with the extra brioche dough. I chose to make a loaf brioche. I looooove brioche. It is so sweet that you won’t even need to spread butter on it (although Nutella, like at Disneyland in Paris, seems appealing). This is my first brioche I ever baked and I have to say it came out great! It tastes just like a brioche one would buy from a bakery in Paris. It is quite easy (and fun) to make, but you have to make the dough a day in advance because the dough needs a lot of resting, 15 hours in total. Because the Tarte Tropézienne recipe is more than 3 pages long (on Word). I’m posting the brioche in this post and the rest of the Tarte Tropézienne in another post. The Brioche: The brioche recipe produces enough for two cakes, but you won’t be successful with the brioche if you make a smaller amount. 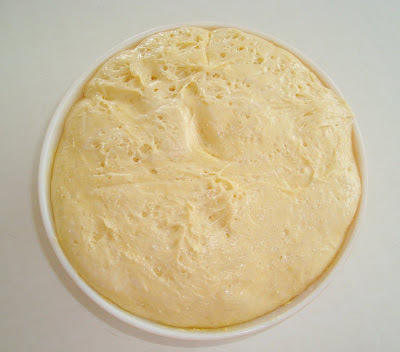 Click here to make a Tarte Tropézienne. - Put the flour, sugar and yeast in the bowl of a heavy-duty mixer fitted with the dough hook and mix on low speed just to combine. With the mixer at its lowest speed, add the milk, eggs and salt in succession, mixing until the flour is moistened. Stop the mixer and, with a rubber spatula, scrape down the sides of the bowl and incorporate the dry crumbs that in all likelihood will be at the bottom of the bowl. - Increase the mixer speed to medium and beat until the dough comes together and cleans the sides of the bowl, 5 to 10 minutes. Scrape the sides of the bowl as needed. 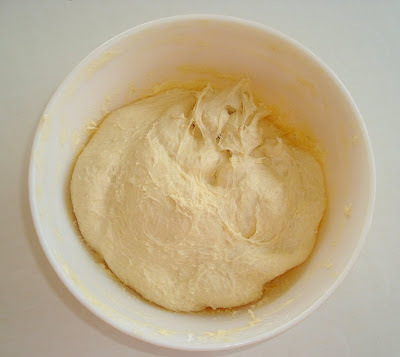 When you start this beating process, the dough will look hopeless – persevere and it will smooth out. - Cut the butter into 6 or 7 pieces. The butter should have the same consistency as the dough. Increase the mixer speed to medium-high and add the butter a couple of pieces at a rime, mixing until it is incorporated. Continue to mix until the dough detaches itself from the sides and bottom of the bowl, curls around the dough hook, and makes a gentle slapping noise as it hits the bowl. 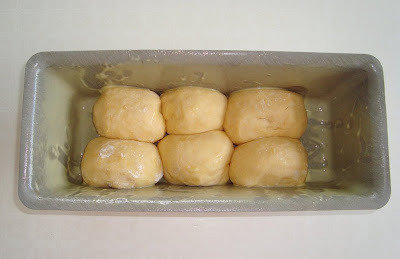 The process of incorporating the butter and beating the dough until it detaches might take as long as 15 minutes. 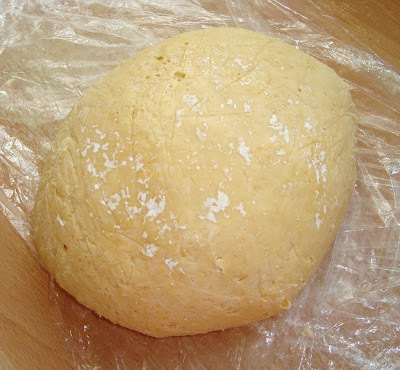 When the dough is properly beaten, it will be silky and voluptuous. - Gently deflate the dough (this means forming a fist with your hands and pushing the center of the dough down a couple of times to let the excess air out, flour the top, fun to do!) and press a piece of plastic wrap against it surface. Cover the bowl well with plastic wrap and place it in the freezer until the dough doubles in bulk again, 2 to 3 hours. (mine didn’t doubled much in the freezer) Deflate the dough, remove it from the bowl, wrap it tightly in several layers of plastic wrap and refrigerate it for at least 6 hours or overnight. - Whisk the ingredients together in a small bow until well blended. - Generously butter an 8 ½ by 4 ½ inch loaf pan. Divide the fully risen and chilled dough (half of the recipe for Tarte Tropézienne) into 6 equal pieces. Working with one piece of dough at a time on a clean unfloured work surface (marble is deal), roll the dough under your cupped palm to form it into a tight ball. Push the dough around and around with the hell of your hand and press down gently with your palm to form a ball. Repeat with the remaining pieces. 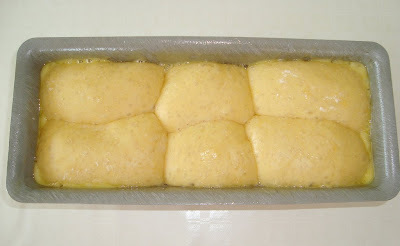 Place the pieces side by side in the pan (you’ll have 2 rows each with 3 balls of dough), cover the pan loosely with wax paper and allow the loaf to rest in a warm place (about 72°F/22°C) until the dough doubles in volume, 2 to 3 hours. - Preheat the oven to 375°F/190°C. Glaze the top of the loaf with the egg wash.
Bake the loaf for 20 to 22 minutes, or until deeply golden and an instant-read thermometer plunged into the center of the loaf reads 190°F to 200°F. Unmold the loaf and cool to room temperature on a rack. 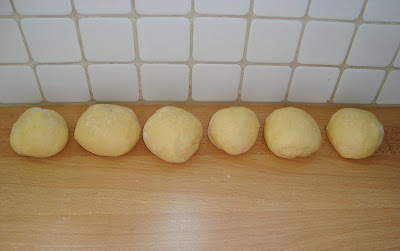 The brioche dough, still quite small. But after 3 hours ... kaboom! What do you expect with 3 (!) packages of yeast? After resting in the refrigerator overnight, the dough blew up like a balloon! My loaf pan is too big and too narrow! But thankfully, after 3 hours of rising it turned out ok. Perfect as it is, with no butter or anything. Brioche is such an amazing bread. It's my favorite for bread pudding. 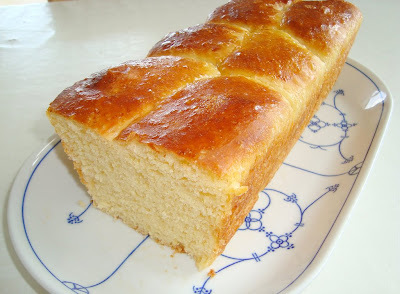 I've never tried brioche - I think I must one day soon. Got my loaf in the oven proving now! Noticed you didn't have milk listed on the ingredients. I used around 50ml and it seemed to be ok.
Ryan you are absolutely right! I forgot to add 1/3 cup milk to the ingredients list, my bad. Hope everything still worked out for you. This brioche is amazing! JK. What kind of yeast did you use? I only have Active Yeast, which I think needs to be dissolved. Any idea how much? I used 3 packages of active yeast. I don't think it needs to be dissolved, didn't say so in the book and it worked out fine for me. Let me know if you have any questions! This is one delicious brioche! I followed this recipe and after 15 hours of waiting when I came to eat it, it tasted very alcohol, what did I do wrong?? I was so gutted after all the hard work and waiting! :( any ideas? 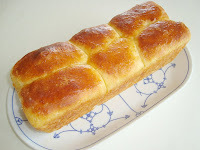 I made the brioche last night. It came out dry but still edible. I used bread flour, would this be why it came out dry? @dlew: Yes, that could be the reason. Bread flour and all-purpose flour are not always interchangable. Especially since brioche is more like a cake-bread than a normal bread. Sorry to hear it was too dry! The book doesn't specify it, but I always use dried yeast. I made this today and omg the brioche tastes and smells so yeasty! The aroma of the butter is overpowered by the amount of yeast that is in this recipe. Is it supposed to be like that? Pre-baked it smells pretty yeasty, yes. But does it still smell very yeasty when baked?